Having us customize the look of your survey to match your company’s branding raises the response rate and gives your project a professional and polished look. 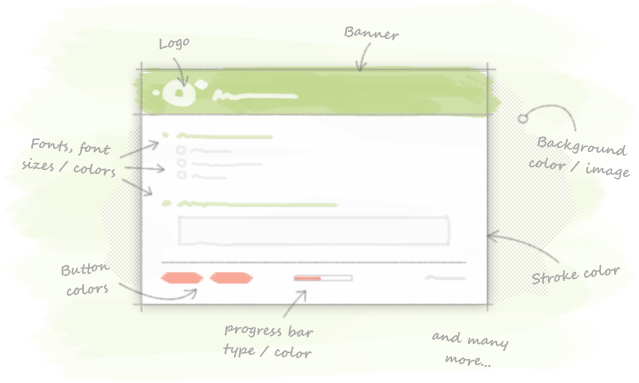 One of our designers can create a reusable theme based on your website or design guidelines. With a custom design you are sure that your survey project perfectly matches your image. All elements (home page, survey, e-mail invitation, e-mail reminders, thank you page, shared results page, respondents FAQ) are fully designed in the desired layout. Respondents are familiar with your look and feel. Therefore the professional looking survey gives you an optimal response. One of our designers creates the design within two working days. By default it matches your website. If you have specific requirements or guidelines, or you want to use some graphics, he incorporates them into the layout. A custom design by one of our designers based on the look & feel of your website, can be re-used for all your upcoming surveys. For a design based on your company’s design guidelines, we will be happy to send you a free quote. If you have any questions or want to order a custom design for your project, please contact our project managers.